Born in Germany, Zerbe immigrated to the United States in the 1930s. He taught at Harvard, and later became the Head of Painting at the School of the Museum of Fine Arts, where he deeply influenced the trajectory of Boston’s twentieth-century artistic legacy. He became a figurehead of the Boston Expressionists, teaching many of the artists who came to be associated with the movement. Zerbe’s work was considered part of German Expressionism, influenced by Max Beckmann and Oscar Kokoschka. As a teacher, Zerbe stressed technical discipline among his students, but also encouraged experimentation with materials, imagination, and expressive imagery—all hallmarks of Boston Expressionism. A significant portion of the surface of Under the Chandelier is occupied by a detailed, elaborate chandelier hanging from the ceiling. The chandelier presses down on the artist, dwarfing, constricting, and threatening him, just as realism had become a threat to the modern artist. 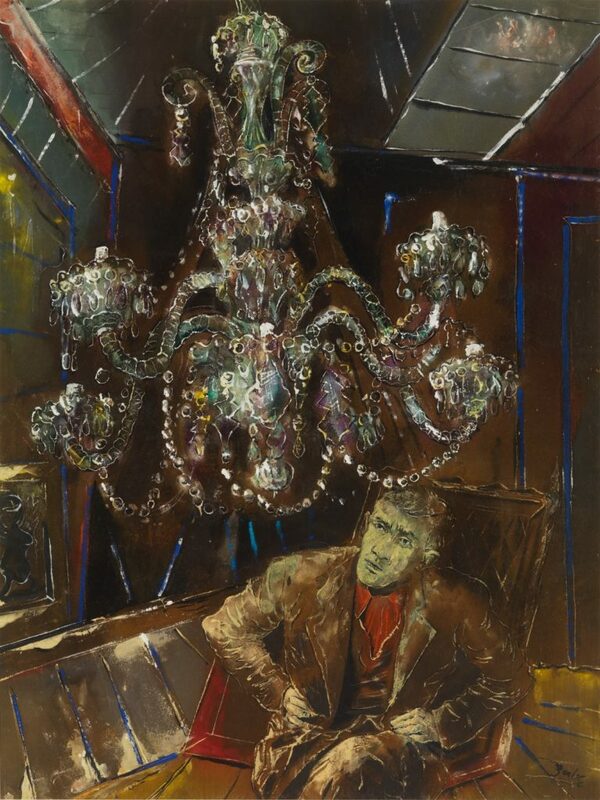 The imagined portrait of Hyman Bloom below the chandelier highlights an interest in light, memory, and the pressures of the life of an artist, particularly as the increasingly influential New York art world began to abandon representation in favor of an emphasis on pure abstraction.